If I ever have my own bakery, this recipe is going on the menu. Delicious doesn't even begin to describe it. Moist and spicy with the pleasant tang of whipped cream cheese frosting. This recipe is from 1910 and from the amazing cookbook, Heirloom Baking with the Brass Sisters. Ready for the recipe? 1. Set the oven rack in the middle position. Preheat the oven to 350-f degrees. Line the bottom and ends of a 9" x 5" x 3" loaf pan with a single strip of wax paper or parchment paper. Coat the pan and wax paper liner with vegetable spray. *I used Pam with Flour liberally and was able to skip the wax paper/parchment paper step. I love that little can of spray! It is a miracle! 2. Mix together flour, ginger, cinnamon, and salt. 3. Cream butter and brown sugar in the bowl of a standing mixer fitted with the paddle attachment. Add molasses and combine. 4. Add sifted dry ingredients alternately with cold tea. Dissolve baking soda in hot water and add to batter. Add egg and combine thoroughly. 5. Pour batter into loaf pan. Bake 45 minutes, or until tester inserted into loaf comes out clean. Cool in pan on raack for 20 minutes. Invert pan and place on rack to continue cooling. Serve gingerbread hot with lemon sauce or cold with whipped cream and chipped walnuts. Store loosely covered with wax paper at room temperature. 1. In a small bowl beat whipping cream until stiff peaks form; set aside. That sounds really good - anything with cream cheese frosting should though, right? Will have to try it. Those tiny gingerbread man sprinkles are absolutely adorable! Where did you buy them? Ooooo Parker, you are killin' me with all of these baked goods!!! Way back in the stone-age when I was in Home Ec (8th grade) my girlfriend and I baked brownies so hard they would not come out of the pan! We had to THROW the pan against the exterior brick walls of the school and it STILL would not come out! Needless to say, nowadays my baking comes straight out of a box. You can't really screw that up! haha! Yum! Hubby loves gingerbread even more than I do. This recipe would be a winner at our house. I got those sprinkles from crate & barrell on sale probably a year ago? so they may not have them anymore.. I plan to try this recipe this fall..if I can wait that long! wow! can't wait to try this! i love the little gingerbread man sprinkles on top! Lovely. I would have made this, had I not made some gingerbread slices of my own. Great and with the gingerbread men sprinkles, perfect! What?! I've never heard of using tea in a cake before! I need to try this! 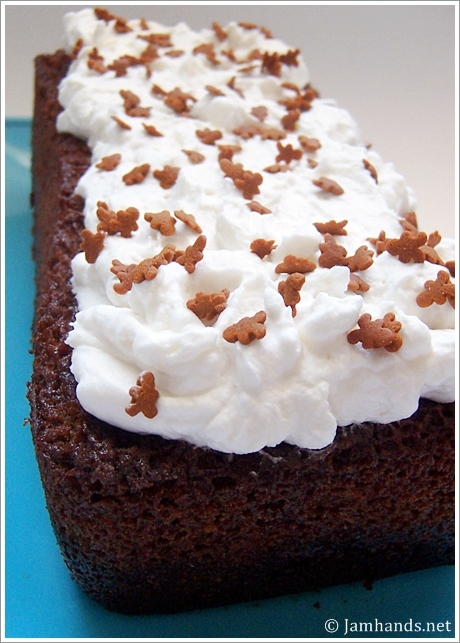 This recipe looks wonderful and the little gingerbread guys on top just make me smile...so cute! Love the cake and would like to try. Can I substitute molasses with honey without much difference in taste?